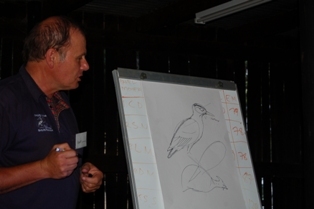 A ringing and atlasing workshop was held at Barberspan Bird Sanctuary, a reserve of the North West Parks and Tourism Board, from 9-16 March. 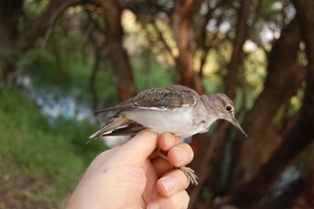 Nearly 700 birds of 58 species were caught. Many new pentads were atlased for the first time by atlasers attending the workshop. PHOWN Virtual Museum records from this trip may be viewed here). Few waders and waterbirds were caught compared to last year, due to high water levels after several months of rain. Several non-waterbirds were caught in the baited walk-in traps, including doves and sevearal Ant-eating Chats. 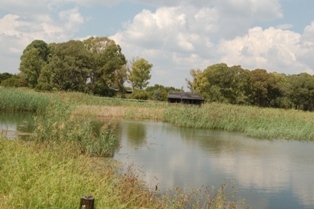 Mist-netting was done at the reeds near the walk-in traps and near the hide. 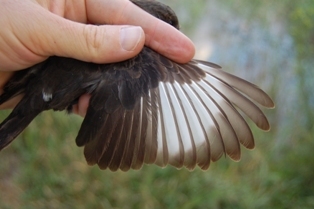 Again, Red-billed Queleas were targeted and given orange colour rings together with metal rings to see if farmers reported them on their land (see more here). 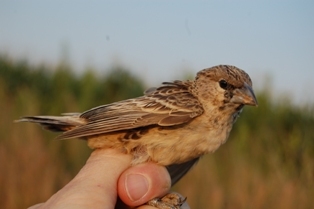 On 11 March a team of ringers drove to a Sociable Weaver colony (PHOWN record) near Ottosdal, 50 km from Barberspan. Juveniles and adults were caught, and chicks could be heard in the nests, indicating a good breeding season. On the weekend there was early ringing and atlasing but much of Saturday and Sunday morning were dedicated to talks - the talk titles may be viewed in the program. White-browed Sparrow Weaver colonies were counted around the camp and office area and there was an increase in nests compared to last year - 7 colonies with 134 nests (in 2010 there were 3 colonies with 51 nests). Several adults were recaptured but low breeding-type nests that could be checked were found to be empty. 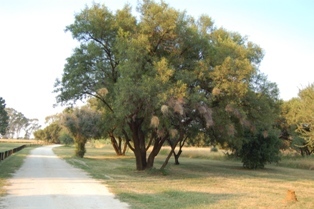 A large number of PHOWN Virtual Museum records (see here) were obtained while atlasing and ringing. 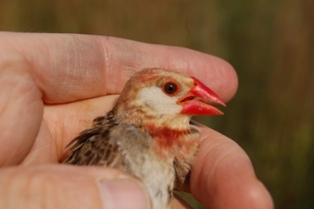 Alan Lee and Julia Pierini wanted more ringing than just mist-netting and checked 118 Southern Red Bishop nests. This resulted in 32 chicks of the correct age being ringed. A mouse was found sheltering in one of the nests, even though all the nests were above thigh-deep water! Herman and Zephné Bernitz with Dominic D'Arcy and Julia decided to check bishop nests near the hide. They checked 185 nests and ringed 17 nestlings. Ecotone Africa provides nets and equipment to supplement stock held at SAFRING, and they sponsored three nets as prizes. 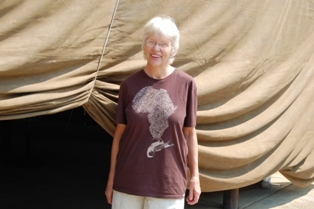 These were awarded to Andrew Mvundle (for qualifying as a waterbird ringer during this workshop), Herman Bernitz (for his efforts in ringing bishop chicks in deep water), and the Zimbabwe ringing group (for driving the furthest to attend the ringing workshop). 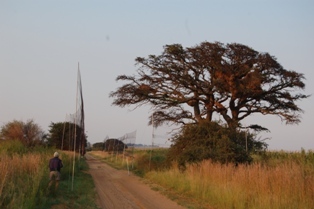 While the ringing and atlasing continued at Barberspan, I left for Nelspruit to target tropical weavers and attend the BLSA annual meeting - read more here. North West Parks and Tourism Board provided the facilities at the Barberspan at a reduced fee and sponsored 2000 metal and 2000 colour rings for quelea (2010 and 2011). 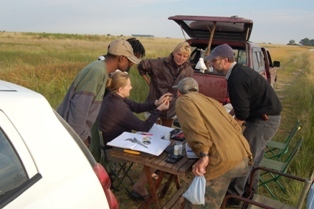 We are grateful for all the help received in organizing this event from Sampie van der Merwe, the reserve warden, and his staff and especially the North West Parks Board. Jaco Botha, NWK, kindly provided grain for baiting the waterbird traps. Roston Bibb kindly loaned a double door Coke fridge for the campers. Ecotone Africa sponsored three nets as prizes. Zephné Bernitz did a wonderful job of organising the logistics. Thanks to Herman and Zephné for a lift for me and hospitlaity en route to Nelspruit.